Workplace • Contest winner VISTA gets $300,000 in services from Retrofit. 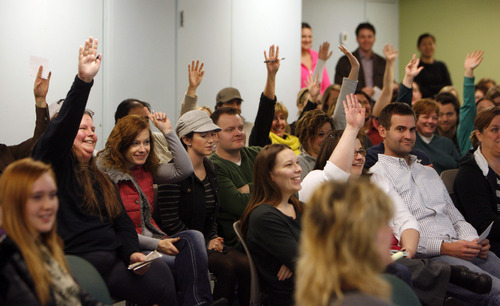 Francisco Kjolseth | The Salt Lake Tribune Multiple VISTA Staffing Service employees raise their hands to indicate they are interested in taking advantage of services from Retrofit Inc., that operates a "data-driven" weight-loss program. The Salt Lake City-based company had just found out they had won Retrofit's contest and will receive up to $300,000 in free weight loss services. Retrofit launched its "Retrofit My Company" contest Nov. 13. Qualifying entrants submitted a 500-word essay describing why they should win a free year of weight loss for up to 100 co-workers. Vista employee Dr. Rich Interdonato put together the winning entry. Francisco Kjolseth | The Salt Lake Tribune Michael Pananos, a territory manager for VISTA Staffing Service in Salt Lake, signs up for a free year of weight loss services from Retrofit Inc., that operates a "data-driven" weight-loss program. Pananos exclaimed "this is incredible, I need to do something!" following the announcement on Wednesday morning that the company had just won Retrofit's contest and will receive up to $300,000 in free weight loss services. Retrofit launched its "Retrofit My Company" contest Nov. 13. Qualifying entrants submitted a 500-word essay describing why they should win a free year of weight loss for up to 100 co-workers. Vista employee Dr. Rich Interdonato put together the winning entry. Francisco Kjolseth | The Salt Lake Tribune Retrofit Inc., which operates a "data-driven" weight-loss program, gets ready to announce to the employees at Salt Lake City-based VISTA Staffing Service a "Live Surprise" that they have won Retrofit's contest and will receive up to $300,000 in free weight loss services. Retrofit launched its "Retrofit My Company" contest Nov. 13. Qualifying entrants submitted a 500-word essay describing why they should win a free year of weight loss for up to 100 co-workers. Vista employee Dr. Rich Interdonato put together the winning entry. 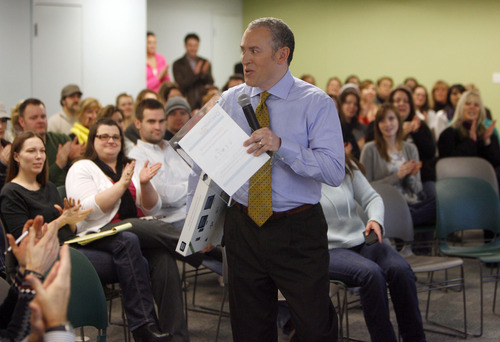 Francisco Kjolseth | The Salt Lake Tribune Jeff Hyman, CEO of Retrofit Inc., which operates a "data-driven" weight-loss program, announces to the employees at Salt Lake City-based VISTA Staffing Service with a "Live Surprise" that they have won Retrofit's contest and will receive up to $300,000 in free weight loss services. Retrofit launched its "Retrofit My Company" contest Nov. 13. Qualifying entrants submitted a 500-word essay describing why they should win a free year of weight loss for up to 100 co-workers. Vista employee Dr. Rich Interdonato put together the winning entry. A Utah company and its employees are about to experience firsthand how employers can trim expenses without reducing their workforces, by helping workers, well, reduce. "Employers incur an average of almost $1,500 a year in additional health care expenses for each overweight employee," said Jeff Hyman, CEO of Retrofit, a provider of company weight-loss programs. "Such high costs drain companies of money that could otherwise be invested in growth, new products and hiring." On Wednesday in a surprise visit, Retrofit Inc., awarded Salt Lake City-based VISTA Staff Solutions $300,000 in services to help revitalize workers by helping them engage in more healthy habits. The award was based on a contest essay by VISTA employee Rich Inderdonato, who wrote that company workers "spend a large portion of their day practicing the &apos;sedentary arts&apos; of desk-bound communication. The lack of physical activity and the availability of convenient, high-calorie snack foods are actually occupational hazards that put employees at risk of gaining weight." 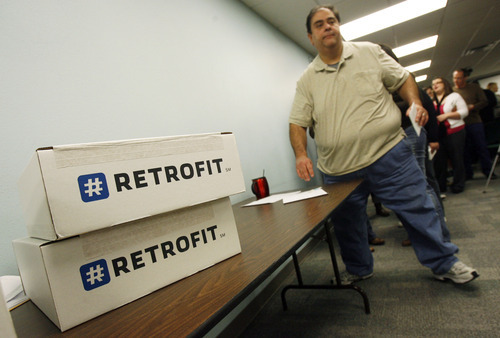 Working with Retrofit would inject the fun of a health promotional intervention into the workday and "that would be a warmly welcomed change," wrote Interdonato, who also is an assistant professor in the Department of Health Promotion and Education at the University of Utah. VISTA joins a list of Retrofit corporate clients, including Dolby, Oreck, Sagent Pharmaceuticals and Millennium Pharmacy Systems, that use wireless and remote technology to help employees lose weight. Each client consults with a registered dietitian, exercise physiologist and behavior coach via Skype video conferencing. In the effort to get healthy, the stakes are high for companies and their workers. Obesity in the workplace costs employers $73.1 billion annually through medical expenditures, absenteeism and reduced productivity, according to a Duke University study. Eric Finkelstein, deputy director for health services and systems research at Duke, recommended that employers promote healthy foods in the workplace, encourage a culture of wellness from the CEO on down and provide economic and other incentives to employees who show clear signs of maintaining a healthy weight.